Mon., Feb. 19, 2018, 10:18 p.m.
Kristy Wallace scored 23 points and had seven assists as No. 3 Baylor won its eighth consecutive Big 12 championship Monday night with a 93-87 win over No. 6 Texas in Austin, Texas. Wallace scored 14 in the third quarter and rescued the Lady Bears after Texas had started the second half with a charge and briefly held the lead. 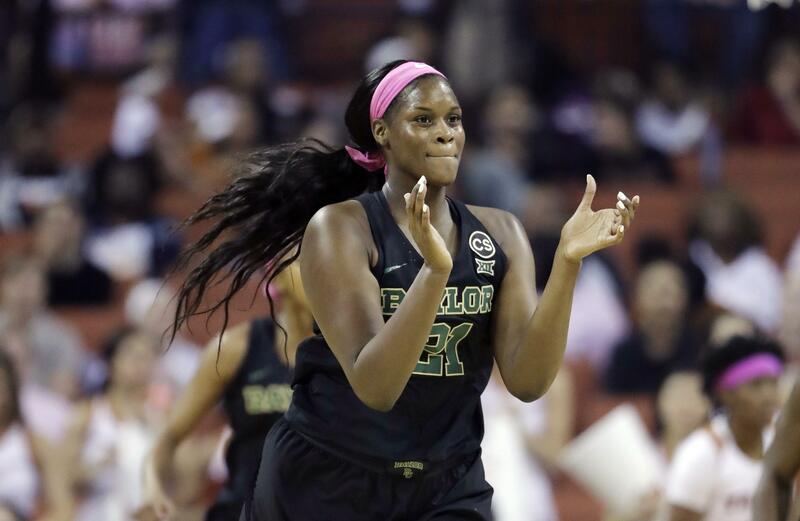 Wallace scored eight in a 14-5 run that allowed Baylor to take control of the game again and the Lady Bears kept Texas at a safe distance the rest of the way. Texas came in two games behind Baylor and needed a win to keep its own conference title hopes alive. Brooke McCarty led the Longhorns (22-5, 13-3) with 32 points, with 16 in the fourth quarter in a furious comeback bid. (8) Oregon 101, (10) UCLA 94 (OT): Sabrina Ionescu scored seven of her 23 points in overtime and the Ducks (25-4, 14-2 Pac-12) outlasted the Bruins (21-6, 13-3) in Eugene, Oregon. Ionescu added 12 assists for the Ducks. Oregon’s 14th conference win matched its best from 1999-2000 when it won the Pac-10 title. Oregon built a huge first half lead before UCLA rallied while holding the Ducks without a field goal for the final 6:18 of regulation. With the game tied at 90, the Bruins had a chance for the win in regulation, but they missed a layup just before the buzzer. Ionescu took over in OT. She scored the first four points in the extra session and the Ducks didn’t look back. Ruthy Hebard finished with 14 points and 11 rebounds. She made her first three shots to set an NCAA men’s and women’s record with 33 consecutive field goals over four games. Jordin Canada and Monique Billings each scored 26 points and had double-doubles for the Bruins. Canada’s 13 assists gave her 765 for her career, breaking the Pac-12 record of 757 by Stanford’s Sonja Henning in 1988-91. (20) Duke 79, (9) Florida State 66: Lexie Brown scored 30 points, and the Blue Devils (21-7, 10-5 Atlantic Coast Conference) upset the Seminoles (22-5, 10-4) in Durham, North Carolina. Rebecca Greenwell added 22 points with three of her six 3-pointers coming during the decisive run, and Leaonna Odom had 15 points to help the Blue Devils earn their most significant victory – at least, by the rankings – of the season. Nicole Ekhomu had 15 points and AJ Alix had 13 points for the Seminoles, but top scorer Shakayla Thomas had just seven – nearly 11 below her average – on 2-of-10 shooting. (19) Georgia 66, Mississippi State 52: Caliya Robinson had 28 points, 10 rebounds and four assists, Que Morrison also had a double-double and the Lady Bulldogs (22-5, 10-4 Southeastern Conference) beat the Rebels (11-16, 1-13) in Oxford, Mississippi. Robinson scored 16 points in the first half to help Georgia build a 35-18 lead after a 20-6 second quarter. Mississippi rallied in the third to pull within 45-44 but Georgia started the fourth on a 13-2 run to pull away. Morrison had 10 points, 10 rebounds and six assists and Mackenzie Engram grabbed 12 rebounds for the Lady Bulldogs, which entered with two-straight losses to a pair of ranked opponents. Madinah Muhammad scored 18 points for Mississippi, which has lost 15 of its last 17 games. (22) Green Bay 66, Illinois-Chicago 37: Jessica Lindstrom had 22 points, 13 rebounds and four assists for her 14th double-double this season and the Phoenix (24-3, 14-2 Horizon League) beat the Flames (7-20, 0-16) in Chicago. Green Bay has won 19 straight in the series and 25 of the past 26 meetings. Allie Leclaire added 10 points for Green Bay, which extended its lead on IUPUI (12-3) in the conference standings. Lindstrom moved to seventh on the program’s scoring list in the Division I era with 1,392 points, passing Kayla Tetschlag and trailing Kim Wood by 16 points. Before the game, Green Bay announced coach Kevin Borseth agreed to a contract extension through the 2024-25 season. He is in his 15th season at Green Bay and owns a winning percentage of .798 with the program. UIC was just 14-of-47 shooting (29.8 percent) from the field and turned it over 20 times. Published: Feb. 19, 2018, 10:18 p.m.